Your customers made a choice to play at your golf course. Use digital signage to communicate your message with players more clearly. 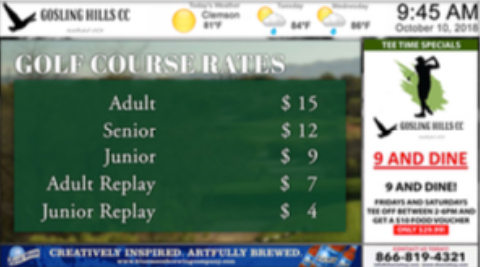 Highlight rate schedules, lessons, outings and leagues, or specials in the tavern or on the course at the beverage cart. Captivate your audience and capture new sales once they arrive on site.